Some suggestions I found interesting. Early season tomatoes are in demand to be included in summer salads and cooking. There are many advantages to planting seed inside whilst it is too cold outside. First, work out when you can transplant outside and sow seed so plants will be strong enough to survive transplanting. Let’s say transplant mid October. So sow seed inside in early September. Tomato plants can be separated from a punnet if you transplant in a cool part of the day and water in quickly. Cover roots whilst transplanting. You can even cover the plants for a day or so until they pick up. Alternatively you can sow in individual cells to reduce transplant shock. 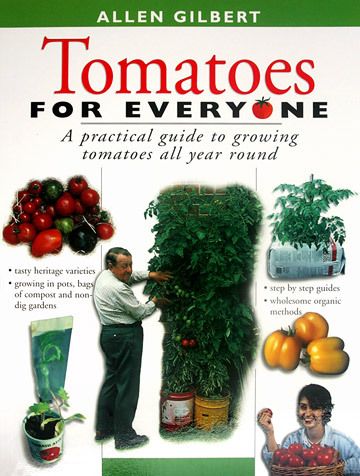 Tomatoes do not like to be waterlogged and should be planted in well drained raised beds if you expect heavy rains during the growing season. Plants will grow through "winter" in areas where there is no frost. Some varieties set better than others in cool condition e.g. Rouge de Marmande. Pests are less in the cooler months. 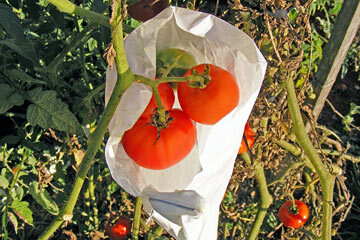 To exclude pests from eating the fruit try the paper or mesh exclusion bags in the Eden Seeds catalogue. Tomatoes are not recommended for people who have suffered cancer.